For those who expect only the best, Beach Colony Tower Penthouse 1B is included in our outstanding luxury vacation properties and is guaranteed to please the most discerning guest. Some rentals just feel right when you enter, and this is one of them. This 16th floor Penthouse is spacious, luxurious and comfortable. Exclusive Beach Colony Resort is located on 11 acres of fabulous beach front. The ingeniously designed, angular living room transforms every residence into a corner unit. Wall-to-wall sliding glass doors and adjoining window wrap around the living room, filling it with light, and revealing the panoramic beauty of the gulf. The sweeping 300 SF terrace will be a favorite spot for quiet moments and lively gatherings alike. The large master bedroom offers a king size bed with new mattress, new hand-scraped hardwood flooring, 36” TV and DVD player, large walk-in closet, and sliding glass doors that open onto the spacious terrace. The uniquely situated, double vanity master bath is a world unto itself. The whirlpool tub, with separate walk-in shower, is surrounded by large, wrap around windows, which open to offer both a view and a feel of the hypnotic gulf. The spacious tiled living area includes 65” 4K Ultra HD TV with Netflix and Amazon video streaming capability, plus many other featured apps, DVD, Sony Blue Tooth Audio System, and new window coverings. The porcelain tile continues into the dining area, entryway, and kitchen. Guests will enjoy the new stainless steel Whirlpool appliances, granite countertops, and custom backsplash in the kitchen. The dining area has seating for 6 at a one-of-kind, custom-built walnut table. There is also seating for 2 at the breakfast bar. The bookshelf in the dining area has an assortment of books for reading on the beach or while you're relaxing on the balcony, along with several board games. The laundry room has new full size washer and dryer. The newly renovated guest bedroom offers an authentic coastal feel. Two unique, custom-built queen beds, new mattresses and bedding, along with a 32” TV/DVD player, as well as new plantation shutters have been added to the carpeted bedroom. The guest bath has been freshly painted and includes a combination tub/shower. Custom made, decorative touches to both rooms complete the coastal feel. The separate entry leading into the guest bedroom/bathroom has a pocket door which can be closed to make this a private suite. Great for a second couple. We would like to thank you for all you did to make this 40th anniversary trip special for us. Your staff is professional, helpful and courteous. The condo was luxurious, yet made us feel much at home with everything we needed. The Perdido Key Beach area is our favorite destination for vacations. We will definitely be returning and looking forward to working with you again. The team at Perdido Realty are the best!! Very friendly handled my request and went above and beyond my expectations. Our visit was very good, everything was just perfect! We will only use Perdido Realty for our vacations from now on! Thank you very much for all you did to make our stay so wonderful! Absolutely a great property, we felt like we were home, in fact my wife made the comment I could live here! The condo was the best we have stayed in in this area. We will be back!! I can sum it up in three words.."total customer satisfaction!!!!!" The team was so friendly and helpful. They had a sweet card and bottle of champagne waiting on us, congratulating us on our wedding. The property was absolutely beautiful! Fabulous views, beautifully decorated, high end kitchen, very organized, and lots of information on how everything worked! Wonderful!!! The Perdido Realty outdid themselves on this visit. Knowing that we were there to celebrate our 40th wedding anniversary, we found a bottle of bubbly spirits and a great restaurant recommendation. The staff also arranged delivery of flowers to our unit in advance of our arrival as a surprise for my wife. Couldn't ask for a better reception than you'll receive from the Perdido Realty team. 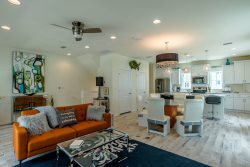 I requested a unit furnished in a "modern" style and the recommendation of the Perdido Realty staff did not disappoint. Our unit was incredible - and now I think we'll refurnish part of our home following that style! Helpful staff. No issues with anyone. Property was beautiful. Plenty of kitchen items and lovely appliances. Everything well maintained. Comfy bed. Wonderful bathroom. Everyone I spoke with was very knowledgeable, kind, helpful. Thank you! Our stay at Beach Colony Tower PH1B was awesome! Everything from start to finish. The reservations, check in, the PH1B unit was amazing, super clean, the view from balcony was amazing, sunrise from master bedroom was nice, beach sand and the water was beautiful, beach chair service was great, facilities at the pools were great, we felt safe and secure at all times, security officers on site were helpful and friendly, elevators worked efficiently, traffic was not bad, publix and restaurants conveniently close by, check out was easy even though we hated leaving. The only thing that could have made our stay any more pleasant would be for Beach Colonies to add a couple more luggage carts per each building. Thank you so very much for such a wonderful vacation memory!! Excellent service. Had to make a call because we had trouble getting in the room & the girl helped us & she made it easy for us. Great realty company! Keep up the great work! Beautiful condo all around, love the decor, the space, the cleanliness, and the views were unbelievable. Loved seeing the Blue Angels fly over- just WOW! No other condo can compare to this one. We will definitely be back next summer if not before and this condo will be the place we stay! Excellent. All properties should have a Kurig Coffee maker like this one did! Sounds trite but it made a difference to me. Check-in was a breeze. Very efficient presentation of directions, keys, etc. Check-out was surprised to find staff there at 7am on a Saturday, but they were also very nice and exchange of keys was simple. Had to make a call to the office on Monday to figure out turn-on for shower in guest bath. Someone was there within 5 minutes of my phone call and showed us how to switch it on...All in all, excellent interaction with everyone at Perdido Key Realty Vacations.